Ultra compact, wall-mountable 8 Port Web Smart Gigabit Managed Switch. The VigorSwitch G1080 is a small, high-performance Gigabit smart switch designed for small and medium business networks that require simple network management, with support for VLANs, QoS and Link Aggregation (increases uplink speed for high data volume applications). 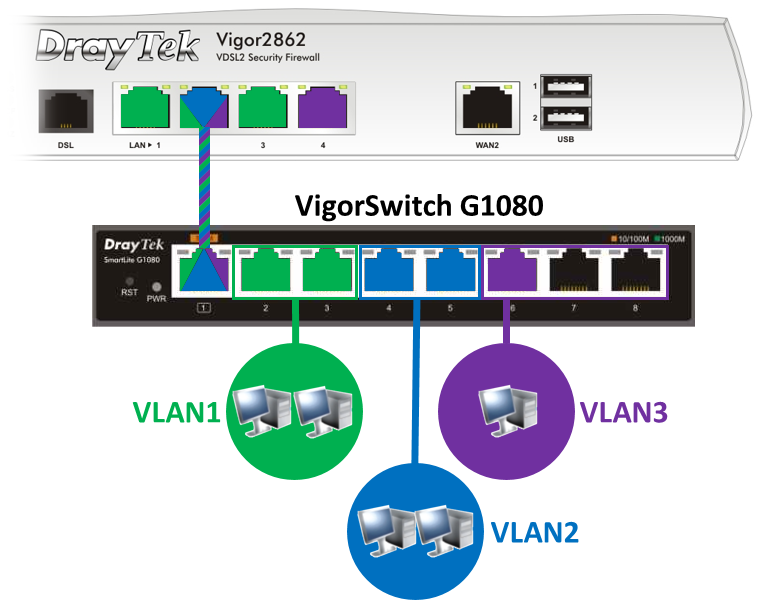 This type of VLAN can be used to segment networks using a single network link between the DrayTek Vigor router with multiple subnets (VLANs) and the VigorSwitch G1080, with different ports being assigned to each of the router's VLANs. In this example, there are three VLANs being passed through the VigorSwitch G1080's first port, providing network ports to each of these networks. 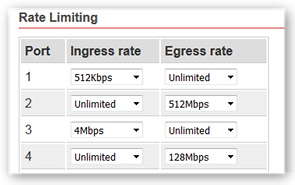 The clients on connected to each of these VLANs are isolated from each other, with access being controlled by the Vigor router's firewall. DrayTek Central Switch Management can assist with configuring the VLAN settings on the VigorSwitch - see the 'VLAN Configuration' section of the 'Central Management' tab for more details. This type of VLAN configures the VigorSwitch G1080 as two separate network switches, with some ports being assigned to each of these networks, but kept fully isolated from each other. The VigorSwitch G1080 supports Quality of Service to prioritise latency sensitive traffic using both 802.1p CoS (Class of Service) and Port based mode. 802.1p CoS allows both software applications - such as Skype, and network devices - such as VoIP handsets that send priority tags with their time sensitive data, to be prioritised over general data transfers using the 4 flexible Queues and scheduling system of the switch. With Port-based Quality of Service, VoIP phone handsets can be assigned a higher priority than a Network Attached Storage server, so that file transfers over the network cannot affect call quality. The VigorSwitch G1080 can control the bandwidth available to each of its network switch ports, with the Ingress rate (data received on that port) and Egress rate (data sent from the switch to that port) being configurable in increments from 512 kilobits per second, 1 megabit per second, 2mbps, up to 512mbps and Unlimited. With IGMP Snooping enabled, the VigorSwitch G1080 can determine which ports are requesting multicast data streams, with IP-TV for instance, and send that data only to the ports that have requested it, instead of the multicast streams being sent to all ports of the switch. The VigorSwitch G1080 can keep track of up to 128 multicast groups. When connecting the VigorSwitch G1080 to a larger network switch such as the VigorSwitch G1280, the link between that switch and the G1080 could be a bottleneck for the devices communicating between those two switches. With Link Aggregation configured on both switches and two 1Gb/s network links between the two switches, traffic can be shared between the two ports, effectively doubling the bandwidth of the uplink and providing resilience should one of the links fail.